After an adventurous drive through the mountains, we arrived in Pueblo, CO at the Pueblo Chemical Agent Destruction Pilot Plant (PCAPP) with the Bechtel Pueblo Team or the BPT. The Bechtel Pueblo Team is a partnership of Bechtel National Inc., AECOM, Parsons, and Batelle Memorial Institute. The site currently holds a crew of 1,176 personnel, with a majority of the crew being local hires. 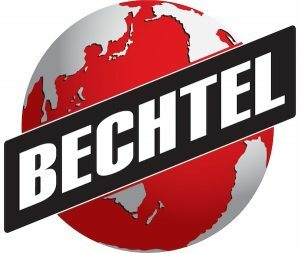 Bechtel is a global company with a 0.45 recordable rate in safety. 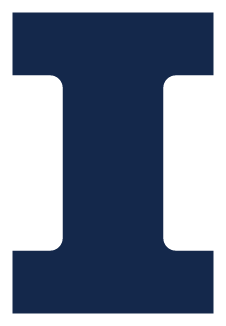 This number is far below the average, and below the threshold. This safety rating is a major draw, especially for a project like this. This safety rating is a major draw, especially for a project like this. 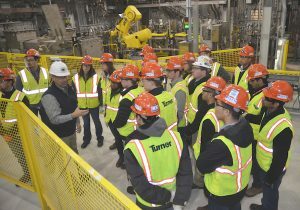 Rick Holmes, Bechtel Project Manager, took the time to explain the reasoning behind the project. In the late 1990’s, a treaty was signed to destroy the stock piles of chemical weapons across North America. The Assembled Chemical Weapons Alternatives (ACWA) is responsible for managing the safe and environmentally sound destruction of the chemical weapons. The Bechtel Pueblo Team was brought on as the systems contractor to design, build, systemize, pilot test, operate, and close the PCAPP project. The Pueblo Army Depot, located on 85 acres, is home to 2,611 tons of mustard agent in mortar rounds and artillery projectiles. These will be neutralized and processed through a biotreatment process. The process is completed through a series of steps in multiple buildings. This multi-building process was actually not the original design. Previous to the early 2000s, the design called for a single, large structure to house everything. This was not deemed to be affordable, therefore the multi-building design was created. From a technical standpoint, the project is about 77% complete in the systemization stage, and are preparing to begin pilot testing in the coming months. Pilot testing is important to ensure all equipment is properly operating, and any adjustments that need to be made can be done in a safe, controlled environment. The next phase would be operations which is scheduled to last approximately 47 months. This will be done at a rate of 24 hours a day and 7 days a week. Following this completion, the project will begin closing out in the 2 years after operations is complete. When working with chemical weapons from the World War II era, there are bound to be a few defective or problematic munitions. These must still be destroyed in a proper and safe manner. To do so, the team uses an Army’s Explosive Destruction System (EDS). The EDS will destroy approximately 560 problematic munitions that have been discovered thus far. This area is contained by a 24 inch concrete wall and heavily monitored ventilation to ensure safety during the destruction. The PCAPP project is astounding not only for the type of work being done, but for the recognition of the effort of work being done and the community involvement. A prestigious recognition PCAPP received was the Voluntary Protection Program (VPP) award. This is given to less than 3% of companies in the country. This project is also very conscious of the environmental impact. Daily, there are 40-50 thousand air samples done to ensure there is no trace of hazardous agents. This is because there are 130,000 cubic feet per minute of air being pulled in to the facility. This heavy circulation from least possible contamination to strongest possibility of contamination must be monitored to ensure no harmful chemicals enter the atmosphere. For more environmentally friendly measures, water is recycled on the site to create a more sensible site and more efficient water supply for the almost desert like location of the project. In addition to this, there is a strong focus on giving back to the community. Several fundraisers and events are held through the year, from painting homes to food drives to charity events, the PCAPP team is greatly involved and looks forward to more chances to help the community they are impacting with their construction work. Overall, the impressive nature of this project was a pleasure to visit and tour. Learning about the culture of the Bechtel environment, as well as the level of detail needed for the PCAPP project, has helped to make the GLCM trip to Pueblo, Colorado a fascinating experience. Unfortunately, almost no photographs were allowed during the tour, so we are unable to share the experience visually.